Mobile Tenant Screening. Yes, this means you can easily order from any device now. The ordering process looks great on SmartPhones and Tablets including iPhones, iPads, Androids (Droid), etc. Improved Home Screen. With quick link icons you can intuitively navigate the client area. Search by Name. You no longer will have to scroll through to find your completed orders, but will instead be able to type the applicants name and pull the report up on demand. Billing Page. 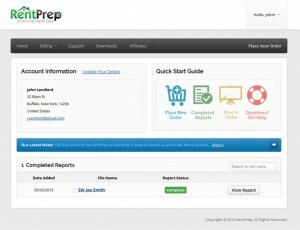 From this page you will be able to view and print invoices and receipts for your orders. Manage Credit Cards. On the previous version, our higher volume clients loved the feature of being able to securely store your payment information for faster check outs. Now all clients can enjoy this convenience if they choose. Add Sub-Accounts. Perfect for property management companies or any clients with multiple users. Now your co-workers can order reports on the same account with their own log in credentials. Download Section. This new feature is great because it comes with a FREE gift! Every client’s Download Section will come equipped with our Landlord Essential Kit. If you want more forms than the application and addendums in the Essential Kit, then order our Form Bundle packed with over 60 forms for landlords. Support Section. From here you will have a direct link to our Screening Department to ask questions. Ask a Screener. This update will add functions to the new Support Section that will allow you to get answers on anything from FCRA questions to interpreting reports. Affiliates Section. The easiest money ever! We have successfully tested an affiliate program that has one client earning over $3000 a month for doing nothing but giving out a link. There’s no selling or work whatsoever on your part, just give your personal affiliate link to a landlord that orders a report and you will get 20% of anything they spend. For the lifetime of that account! Our biggest success story is an affiliate who shared the link with his local Real Estate Investors Association and is now earning huge passive income every month. Live Chat. Get real-time support for ordering, navigating the site or anything you can think of.